A behemoth of a water park that spans 90,000 m², the Aqualand Maspalomas is the biggest in the Canary Islands. And within the enormous expanse of land are 33 jaw-dropping slides, 13 exhilarating rides, and 3,000 m² of swimming pools and a picnic area that family and friends can enjoy all year round. There’s really no better way to spice up the good ol’ Gran Canaria experience than adding Aqualand Maspalomas to the itinerary. 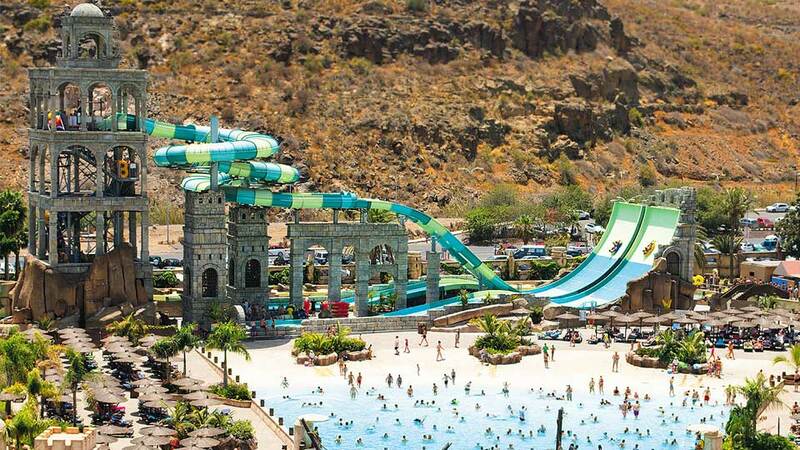 This water wonderland adds fun and thrill to an already fantastic Gran Canaria vacation. Dare to drop from one of the highest slides in the whole of Europe. Spin and go side to side while on a rubber ring in the curved rapids. Ever wondered what it’s like to interact with sea lions? Here, you can even swim them. In Aqualand, there’s not a good enough reason why thrill shouldn’t be included in a fun and relaxing vacation. Gran Canaria has amazing landscapes and the best beaches; however, very few of them can offer the same excitement. In Aqualand, people of all ages can have fun, and there’s always something for anyone willing to get soaked. People who love water, drops, slopes, and speed will fall (figuratively and literally) in love with the wide array of adrenaline-pumping slides in this water park. Dare to propel up, down, and swerve side to side in 13 colorful slides. Guests only need to be in their swimwear and have the courage to try. This astonishing water slide with wonderfully bright colors and light effects is 150 meters long. If the length doesn’t impress, this slide will also send daredevils to over 14 meters fall and eight downhill slopes face-first. Slides can get scary, so some might not want to go alone, or maybe it’s just better to tandem-slide. In any case, Aqualand offers a twin racing water slide for thrill-seeking duos. It starts with two side by side tube slides that will send two brave riders per tube racing down a track before reaching an enclosure that will plummet them down a nearly vertical drop. The twin tubes will then accelerate the pairs to two separate Turbolance slides where they will go uphill then backwards over a hill till they reach the end of the ride. This is probably the most popular one out of the 13 slides. Like the Racer Twin Turbolance, double rubber rings are used so riders can definitely be in pairs. The ride begins with a semi-circular tube slide connected to a huge space bowl, which will then spin riders round and round before exiting through a short tube slide. After going down the tube slides, guests will know how it feels being flushed down a toilet. Families traveling to Gran Canaria with kids should not miss Aqualand Maspalomas. Children, no matter how young, are welcome at Kidzworld. This vibrant Mini Park has two sections to guarantee fun experiences in a safe environment. At the Children’s Paradise, little tykes can have a thrilling experience with its most popular attractions. Meanwhile, the Polynesia has slides, water games, and an overflowing bucket that gives an added waterfall feature. The water park wants to provide an unforgettable fun, adventure and excitement to everyone. To make sure this happens, they’ve set up two family-friendly attractions that will surely leave a beautiful lasting memory. They can enjoy sea-like waves with family and friends every hour in the Discovery Beach, or go swimming and have their pictures taken with sea lions. In Aqualand, guests need not leave for the sea to feel like being in one. After or in between trying the adrenaline-pumping attractions of the water park, guests may want to just unwind. The good news is Aqualand can still help them with that. Adults love relaxing in the huge Jacuzzi that also offers a beautiful view of the neighboring mountain, while kids play around keeping themselves amused by the bubbles. 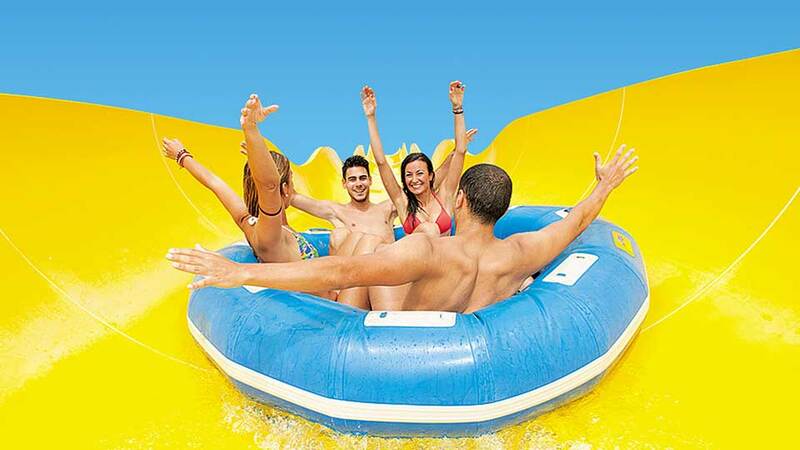 They can also chill while floating on rubber rings that can accommodate up to three persons in the Pirate’s River. For tourists who prefer to go by public transport instead of hiring a car or hailing a taxi, two Global Bus lines can take them to Aqualand. The Global Bus line 45 coming from Bahía Feliz passes by Playa del Aguila, San Agustin, and Playa del Inglés. Its final destination is the Palmitos Park, but one of its stops includes Aqualand. There are three buses in the morning and another three in the afternoon for the return journey. For those coming from Puerto de Mogan, Puerto Rico, Amadores, and Faro Maspalomas, catch Global Bus line 70. It goes through 39 stops, and one of them is Aqualand. The entrance fees for tourists are a bit higher than residents of Canary Islands, but there are lots of promos in the official Aqualand Maspalomas website. Tickets for non-residents range from €17 to €28 depending on the visitor’s age and/or height. For Web Tickets, please note they cannot be used the same day, as they are valid 90 days from the date of purchase. A digital copy saved in a mobile phone or a printed copy must be presented at the park entrance, or full price will apply. The beautiful water park is open all year round unless there’s severe weather. From September to June, it’s open from 10:00 AM until 5:00 PM, and 10:00 AM to 6:00 PM from 1st of July to 3rd of September. As for the attractions, they close 30 minutes before the park’s closing time. Going to the stunning water park and trying all the attractions inevitably make guests very hungry. In Aqualand, they make sure there’s an array of delectable food available everywhere because paradise isn’t much of a haven if it lacks awesome food. Guests can eat and drink whenever and wherever as food services are well distributed in the entire park. Popular park foods like ice creams, pizzas, hamburgers, and even salads in stands are always located somewhere near. For some quiet and relaxing meal, head to the terrace and relish mouth-watering food off their menu. Aqualand does not have overnight accommodations at the moment, but guests can relax in their Jacuzzi or lounge and get a tan in any of their several solariums. It’s important for travelers to be well prepared to make the most out of their Aqualand experience, but just in case they don’t, the water park has them covered. Because some travelers tend to bring a lot of things they won’t need and it’s really impossible for anyone to bring all their stuff around, the park made sure there are plenty of lockers for everyone. What else? Lockers can be shared so there’s no need to get an individual locker for each guest. Wear flip-flops or water shoes as the floor can get really hot. Some even wear their flip-flops around their wrists when going on slides and the park staff never had a problem with it. Hate falling in line? Don’t fret. 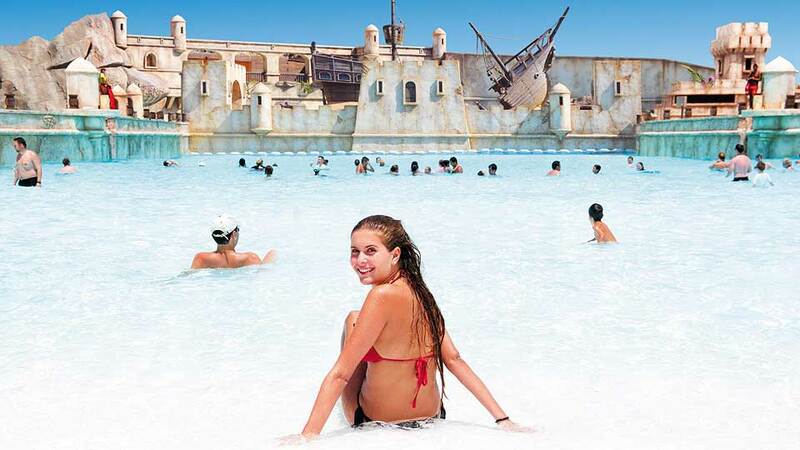 Aqualand offers fast pass tickets for €10 per person, and it’s incredibly worth it. The water park is quite a popular tourist destination so lines can get really long, but anyone with a fast pass can skip straight to the beginning of the line. Easy breezy. There’s just so much to see in the magnificent island of Gran Canaria. So much awe-inspiring natural wonders, to die for food, and entertaining activities to do. Why would anyone visit a water park in an archipelago full of breathtaking beaches? Simple – for the thrill. The Aqualand Maspalomas is exactly what travelers need to upgrade their vacation experience. All other places on the island can make everyone go “WOW!” Every view can make anyone speechless and silent in appreciation. But what can make travelers scream in sheer excitement or spontaneously raise both their hands up in the air? The answer is Aqualand, and it’s the icing on an already delicious Gran Canaria cake.